To familiarize students with rectangular arrays. To emphasize the importance of design intent. To give students more experience with solid modeling. 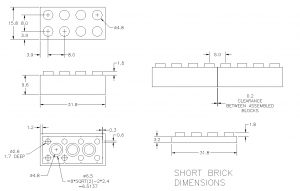 Create a parametric model of the lego block shown below. Two expressions will define the number of pegs in the width and the number of pegs in the length. Name these expressions PEGSLENGTH and PEGSWIDTH. Another expression (BLOCKHEIGHT) will control the height. 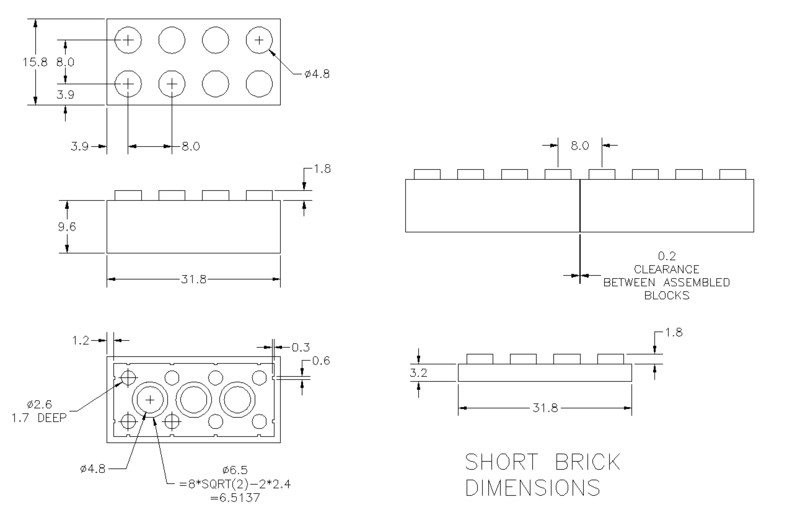 The dimensions given below are for a block with the expressions PEGSLENGTH = 4 and PEGSWIDTH = 2. Your model will need to be valid for any number of pegs from 2 x 2 to 20 x 20. (NOTE: For brownie points, you can suppress by expression the rear boss and create a 1×1 block). Save your work on the Z drive. in your directory under a sub-directory named LEGO. Here is a tutorial for making pattern features: Video. Be sure your model updates in different configurations. You will need this file later (See part family assignment). For your enjoyment, patent for the original Lego block. Also, someone has adapted this assignment for Fusion 360. See for a comparison of the two software versions.